CARMEL, Calif. – Aug. 1, 2017 – James Dietz has captured some of the most compelling moments of Americana in four new paintings that will be displayed in the Automotive Fine Arts Society (AFAS) exhibit during the Pebble Beach Concours d’Elegance on Aug. 20, 2017, from 9:00 a.m. to 4:30 p.m., in Carmel, California. Dietz’s paintings that will debut during the Concours include “Golden Wheels and Golden Wings”, “Looking for the Swede”, “Crossing the Rio Grande” and “Special Delivery”. Dietz is best known as a contemporary artist who tells captivating stories of the men and machines who have helped shaped human history around the world. “Golden Wheels and Golden Wings” is a 21-inch by 31-inch still life of the World War I era. 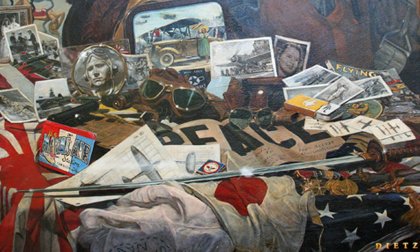 The oil on canvas tells the story of a non-specific Navy pilot and showcases countless period-correct artifacts, which were displayed at the Naval Aviation Museum in Pensacola, Fla. Aviation goggles and flight gear, as well as post cards, magazines, newspapers, playing cards and medals help to tell the story of a pilot during that era. “Looking for the Swede” is a 14-inch by 20-inch oil on canvas. This film noir piece, a favorite genre of Dietz’s, is based on a scene from “The Killers” from the 1946 movie starring Burt Lancaster and Ava Gardner. It features the silhouettes of two hitmen dressed in trench coats and derby hats as they cautiously approach a small town diner in search of “The Swede”. “Special Delivery” is a 21-inch by 31-inch oil on canvas that features a DH4 plane that has landed to deliver mail to an affluent family somewhere in the Midwestern United States. Similar to a scene you might find in the “Saturday Evening Post”, this painting evokes the sentiment of a country slowly evolving after the war. Jim Dietz graduated from Art Center College of Design in 1969 and enjoyed a successful illustration career in Los Angeles and New York. His flow of work ranged from automobile ads to movie posters and romantic and action book covers. His work gradually shifted away from commercial illustration to primarily historical aviation and military art. Dietz has been a member of the World War I Aviation Historical Hall of Fame, and Artist Fellow of the American Society of Aviation Artists and a board member of the Automotive Fine Arts Society. In 2001, Barnes & Noble Publishing released a book on Jim’s World War II art, titled “Portraits of Combat”. In 2005, Dietz had a cameo in Peter Jackson’s remake of King Kong as a pilot of the aircraft that fires at the great ape while he is perched high above New York on the Empire State Building.